Cedar Island, North Carolina, USA is an east – west trending island along the southern rim of Pamlico Sound. It is a fetch limited barrier island and beach, not subjected to open ocean waves. 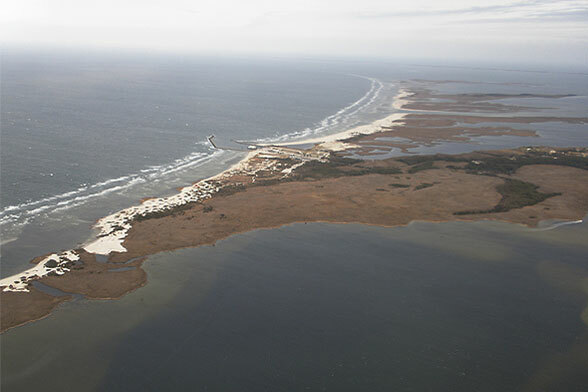 The breakwaters, visible in the photo, protect the landing for the ferry to Ocracoke Island. For more than 50 years there has been a well maintained fence along the road here to keep cattle and wild horses off the parking lot where cars line up for the ferry. As a result of the fence, grazing has been prevented on the western half of the island (in the lower part of the photo) while the eastern half of the island has been extensively overgrazed. Where there has been no grazing, vegetated dunes have formed and a dark green rim of trees at the back of the island exists. On the overgrazed part of the island there are no dunes, very little forest and the island is almost featureless and flat. The beach on the ungrazed part is narrow and backed with dunes (see photo). The beach where the vegetation has been removed by grazers is wider and more or less merges with the island (shown in the photo of the Canadian Geese). The normal yellow brown color of modern beach sands in the southeastern US is due to iron staining on shells and on the surface of quartz grains. Here on Cedar Island the sand is white because the iron staining (and the shells) were removed by long weathering in an ice age sand deposit which furnished the sand for the island. Note the double line of surf indicating that there are two offshore bars. This photo was taken on a March, 2009 flight by Andrew Cooper.